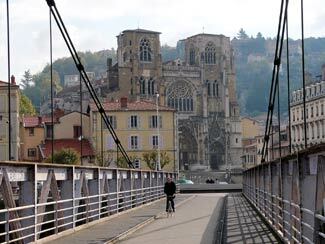 This view from a passerelle or footbridge shows the Cathedral of St-Maurice in Vienne, downriver from Lyon, which was the capital of the Second Kingdom of Burgundy until 1450. The town had its own bishop as early as the 3rd Century A.D., and its first cathedral was probably built on the current church's site about 1,600 years ago. Vienne lost its status as a bishopric in 1790, and today the Romanesque cathedral is technically just a parish church.